The king was the ruler of the state and kingship was elective, but the only possible candidates were descendants of the Merovingian dynasty. Since there was no distinction between the personal property of the king and state property, the kings deemed the whole state as their personal possession. Therefore the kingdom was divided between the sons when the Merovingian king died. This patrimonial view of monarchy was especially evident in 511, when the state was divided between the four sons of Clovis. The king had two important obligations: 1) He led his people into war; 2) he was the keeper of the customary right. The king was surrounded by two classes of servants: the leudes and the antrustions. The leudes were formed by a group of people which were chosen by the king, and they were near to the king as a privilege. The leudes were, in fact, officials of the king. The antrustions were chosen by the king too, they were his armed bodyguards. The antrustion had to vow loyalty to the king, this was one of the prerequisites for this position. 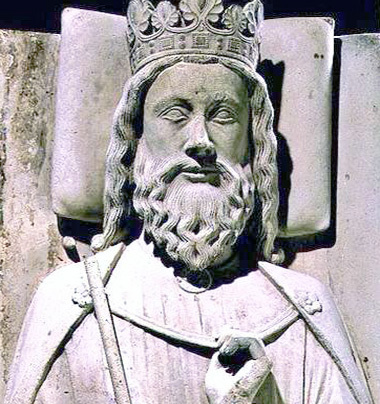 The center of the Frankish rule was the court of the king. The administrator of the king’s court was the majordomo. Earlier, the majordomos were recruited from the personal servants of the king, that is, from the freeman and slaves. There were other administrative officials beside the majordomos. For example, the chancellery was preparing documents and handing out letters, and was mostly manned by Romans. There was a treasurer, who was always in the treasury, which was mobile. The stables were of special importance to the Franks (the horseman was the backbone of the Frankish army). The overseer of the stable, the stabuli, was therefore chosen out of proven and loyal servants. The regions where the Roman population was prevalent were divided into territorial districts for easier governing – the civitates. They had an administrative center, a town which was usually the center of the bishopric too. An official with the title of comes was the ruler of such a district, he had administrative, military and judicial authority. The regions with Frankish population were divided into districts – pagus, which were ruled by lords. The lords had the same authority as the comes. The fief of the emperor, the so called fisc, was not under the authority of the lords and comes, but was overseen by a majordomo. Freeman – The free people in the Frankish state were different in their economic and social statuses. For example, freeman had just enough land to feed their families; on the other hand, small landowners had five to twenty renters which were working for them. It is interesting that there were vastly rich people with no land. Patronage – Great complexes of fiefs were formed during the 7th and 8th centuries, and they were usually under the control of worldly aristocracy or the church. The people who owned no land of their own were seeking the protection of these influential man, the so called, patrons. Collective patronage was another form next to personal patronage; for example, a village could be under the patronage of a neighboring lord. Precarium – The precarium was manifested in multiple forms. For example, precaria data, is when a person takes land from an landowner for personal usage, usually during his whole life. This man is therefore a “precarist”, and he is therefore obliged to the landlord, usually to pay rent and to work the fief of his landlord. Precaria oblata – an impoverished peasant gives land to the landlord, and the landlord grants him this land for usage. The land is no longer property of the peasant, and therefore the land is rented. “The precarists” were usually given church land along with their personal land, and they were obligated to work these fiefs also. We can say that this class is not too different from the Roman colonus. Benificium – Benificium was the privilege to state land. A soldier would be granted benificium for his service in the army. The benificium was composed by the land, and the people that were working on the land. Immunity – Immunity is the protection of private property. A man who is granted immunity by his king has judicial and administrative rights on his land. He is authorized to take the gains of the land for himself. He has the de facto rule over all the people on his land. The officials of the king are not allowed to step on the land of a man who is granted immunity by the king and his unrestricted rule.